More money, more problems? For small Legal Departments, the opposite may be true: While their budgets may have fewer zeroes than their larger counterparts, the pressure to deliver with fewer people and fewer resources is huge. The Association of Corporate Counsel defines “small” as an in-house team with no more than ten lawyers. Writing in its Value Challenge Practices for the Small Law Department guide, the organisation listed a number of challenges these teams face in budget management and the pursuit of value. Chief among them: With fewer lawyers, small teams are crunched to focus on “business as usual” work, so it’s hard to devote time to big-picture budgeting and value alignment projects. We certainly understand the validity of that predicament. However, as we approach a new budget year, it’s worth looking at a few low-fuss tactics that could have high impact in 2019. One place to start: What are the bigger departments doing? Small Legal Departments are also far less likely to receive price reductions from their outside firms; 78.4 percent of large teams said they received discounts, while 50.2 percent of smaller teams did. On a related note, more than half (56.9 percent) of small Legal Departments said they did not feel they had enough buying power to negotiate effectively with their law firms; only a third of large teams felt the same. The disparity between small and large teams is smallest with regard to budgeting; nearly 73 percent of small teams require budgets for matters, while nearly 90 percent of large teams do. If you are among the 27 percent of small Legal Department members that is not asking for budgets for your major matters, start – the ACC has a litigation budget template here. 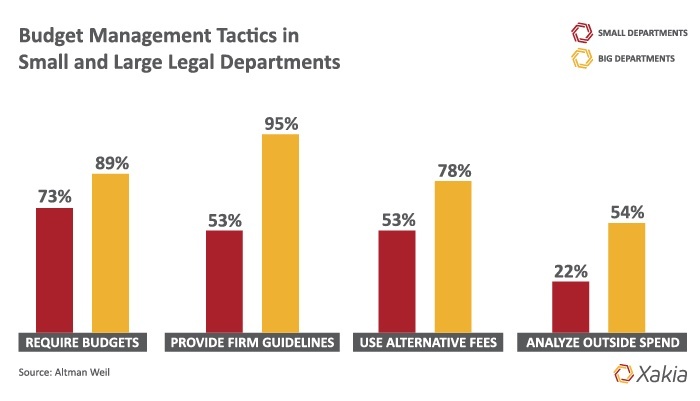 Just over half of small departments provide guidelines to their law firms for billing, expenses and staffing; almost all of large departments do. Having written parameters in place can curb out-of-control billing or inefficient staffing, like unsupervised junior associate research. The American Bar Association has a template available here. Recall from our last article that departments that use alternative fees have a higher probability of hitting their budget goals. You can see how to use basic department data to structure fixed fees here. Larger departments are more than twice as likely to review their outside spend; nearly 80 percent of small Legal Departments are not examining this data, despite the fact it’s likely their largest expense category. A Legal Department Intelligence solution like Xakia can make this fast and painless, but even a manual review of billing data is likely to yield actionable intel. As for buying power, don’t underestimate your leverage. In Altman Weil’s latest edition of Law Firms in Transition, 95.8 percent of managing partners said they believe that increased price competition will be a permanent trend in the marketplace. Law firms expect to compete on price. As the ACC states in Unless You Ask, an invaluable guide to outside counsel negotiations, “You are the urgency driver … You may not get everything you ask for. But unless you ask, you are almost guaranteed to get none of it.